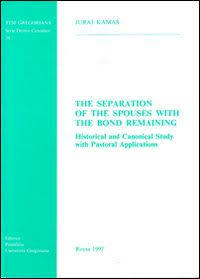 The Separation of the Spouses with the Bond Remaining : Historical and Canonical Study with Pastoral Applications. Dissertation for Doctorate in Canon Law. Pages 258-259: “[Canon 1152 §2] does not state that for such an action [filing in civil court] the innocent spouse needs the prior permission of the competent ecclesiastical authority. However, the requirement becomes clear from Canon 1692 §2 [. . . ] If a civil divorce is the only way to obtain the protection of the civil law, the permsision to seek it should be granted under the following conditions: a) the ecclesiastical decision has no civil effects in the particular country; b) a civil judgement must not be contrary to divine law (can. 1692 §2; c) the petitioner is aware that civil divorce does not affect the marital bond and has no intention to enter into a second union.” […] “This canon speaks about the granting of permission as a particular administrative act issued by a competent executive authority. It means that such a permission is needed for each case. That diocesan bishop has no power to grant a general permission that all separation cases in his diocese will be decided in the civil court. This would be contrary to the provision laid down and Cannon 87 §1 which states that the Diocesan Bishop cannot dispense from procedural laws, that is, laws ‘established to safeguard Justice and protect the rights of the faithful.’ [. . . ] However there is no need for granting permission in those countries where the supreme authority of the church has decided to by the way of Concordat that cases of separation will be handled by civil court” (note number 46). Note 46. See C. De Diego-Lora, <<Medidas>>, 222-223. From bibliography: Diego-Lora, Carmelo de. “Medidas Pastorales Previas en las Causas De Separacion Conyugal.” Revistas y series (REV), Universidad de Navarra, Ius Canonicum Vol. XXV, Nº 49 (1985): 209-225. This source is available for free download from University of Navara HERE, and saved for viewing on Mary’s Advocates website HERE. Una innovación significativa hallamos en el c. 1692 § 2. La po- sibilidad de que el Obispo de la diócesis de la residencia de los cónyuges, atendiendo circunstancias peculiares, licentiam concedere adeundi forum civile. Y este precepto canónico se da como excep- ción a lo que se dispone en el c. 1671, declarativo de una afirmación jurisdiccional de la jurisdicción eclesiástica sobre las causas matri- moniales de los bautizados, de manera que, sin renunciar la Iglesia a esta jurisdicción propia, permite en cada caso, según lo exijan las circunstancias, por decisión de Obispo diocesano, el traspaso juris- diccional al fuero civil. Tal solución sólo es posible en aquellos lu- gares en los que no tienen efectos civiles la decisión eclesiástica. Menor importancia, por el contrario, tiene la disposición del c. 1692 § 3, puesto que ya el c. 1672 atribuye la jurisdicción, con carácter general, cuando se trata de causas matrimoniales sobre efectos me- ramente civiles, ad civilem magistratum. La justificación de esta nueva norma canónica del c. 1692 § 2 puede hallarse en el hecho de que la Iglesia, a nivel de derecho con- cordado, ha reconocido más de una vez que el Estado ejerza su jurisdicción sobre las causas de separación de cónyuges. Así lo apun- tó ya Acebal, tras señalar los pasos dados por la Santa Sede en ámbito concordatario, desde el año 1929 con Italia, al año 1973 con Colombia: «La realidad, pues, es que hoy, después del Concordato colombiano, es un derecho universal (…) que tales causas de sepa- ración, por tolerancia o cesión, bien sea explícita o implícitamente, de la Iglesia, se solventan ante los Tribunales del Estado»22. Hay que pensar, para ser coherente, que si la Iglesia ha cedido, por vía del Concordato, la jurisdicción en las causas de separación al fuero civil, es porque las legislaciones sobre separación de cón- yuges de estos Estados, cesionarios de la Jurisdición, muestran una conformidad esencial, en esta materia, con las exigencias del dere- cho divino, natural o positivo, límite contenido en cualquier norma de remisión que en materia legislativa se establezca a favor del or- denamiento secular, como se patentiza también en el c. 1290. Asi- mismo, cuando se hace la remisión, que el Obispo diocesano deter- minará en cada caso 23, conforme al c. 1692 § 2, se exige la previsión de que la sentencia civil de separación será conforme con el dere- cho divino. No siempre las legislaciones civiles se rigen en estos te- mas por el Derecho natural, sino en razones de conveniencia o uti- lidad, como puede ocurrir con algunas de las causas de separación, por ejemplo, que contiene el vigente arto 82 del Código civil espa- ño124• De este modo, el Obispo diocesano de la residencia de los cónyuges, o el Vicario General o el Episcopal o el Judicial si tienen mandato especial25, dará la licencia a esos cónyuges para acudir al fuero civil, y sólo la concederá en atención a las circunstancias pecu- liares que se den en el caso y sólo cuando tenga garantías de que la sentencia civil que se dicte no será contraria al Derecho divino. A significant innovation is found in c. 1692 § 2. The possibility that the Bishop of the diocese of the residence of the spouses, in the light of peculiar circumstances, licentiam concedere adeundi forum civile. And this canonical precept is given as an exception to what is stated in c. 1671, declaring a jurisdictional affirmation of the ecclesiastical jurisdiction on the matrimonial causes of the baptized, so that, without renouncing the Church to this proper jurisdiction, it allows in each case, as circumstances require, by decision of diocesan Bishop , The transfer of jurisdiction to civil jurisdiction. Such a solution is only possible in those places where the ecclesiastical decision has no civil effects. Minor importance, on the contrary, has the provision of c. 1692 § 3, since already the c. 1672 attributes the jurisdiction, in general, when it comes to matrimonial causes over purely civil effects, ad civilem magistratum. The justification of this new canonical norm of c. 1692 § 2 can be found in the fact that the Church, at the level of settled law, has more than once recognized that the State exercises its jurisdiction over the causes of separation of spouses. As Acebal pointed out, after noting the steps taken by the Holy See in a concordatary sphere, from 1929 with Italy, to 1973 with Colombia: “The reality, then, is that today, after the Colombian Concordat, A universal right … that such causes of separation, by tolerance or cession, either explicitly or implicitly, of the Church, are resolved before the Courts of the State. It must be thought, in order to be coherent, that if the Church has ceded, through the Concordat, jurisdiction in the causes of separation to civil jurisdiction, it is because the legislation on the separation of spouses of these States, assignees of the Jurisdiction, They show an essential conformity, in this matter, with the requirements of the divine, natural or positive right, a limit contained in any rule of reference which, in the legislative sphere, is established in favor of secular ordination, . 1290. Also, when making the referral, which the diocesan Bishop will determine in each case, 23 according to c. 1692 § 2, the provision is required that the civil sentence of separation shall be in conformity with the divine law. Civil laws are not always governed by natural law, but rather by reasons of expediency or usefulness, as may be the case with some of the causes of separation, for example contained in article 82 of the Civil Code Spanish124 • In this way, the diocesan Bishop of the residence of the spouses, or the Vicar General or the Episcopal or the Judiciary if they have a special mandate25, will give leave to these spouses to go to civil jurisdiction, and will only grant it in Attention to the peculiar circumstances in the case and only when it has guarantees that the civil sentence that is issued will not be contrary to divine law. But, in our opinion, this license of C. 1692 § 2, in having to precede the initiation of the civil process of separation of the baptized spouses, is the propitious occasion for the Bishop to . . . The said provisions and definitive sentences with the relative decree of the supreme tribunal of the Segnatura shall be transmitted to the Court of Appeal of the State competent for the territory, which shall, by an order of chamber of Council, render effective the civil effects and order the same to be annotated in the margin of the Act of Matrimony of the civil State. 1. Civil effects shall be recognized for marriages contracted according to the norms of canon law, provided that the act of marriage be entered in the registers of the vital statistics, and the notices of marriage have been previously published at the communal offices. Immediately after the ceremony, the parish priest or his delegate shall explain the civil effects of the marriage to the parties, by reading the Articles of the Civil Code concerning the rights and duties of married people and he shall thereafter draw up, in original duplicate, the certificate of marriage, in which the spouses’ declarations permitted by civil law may be inserted. (C) that the other conditions required by the Italian legislation for the declaration of efficacy of foreign judgments are present. The Court of Appeal may, with the judgment that recognizes a canonical judgment, take temporary economical measures in favor of one of the two spouses whose marriage has been declared null, referring the parties to the competent judge for a final decision on the matter. 3. In entering into the present regulation of matrimonial matters the Holy See herein reaffirms the unchangeable validity of the Catholic teaching on marriage and the concern of the Church for the dignity and values of the family, foundation of the society. On the occasion of the signing of the Agreement that modifies the Lateran Concordat, the Holy See and the Italian Republic, desiring to assure, by means of appropriate specifications, the best application of the Lateran Pacts and the agreed upon amendments, and willing to avoid any difficulties of interpretation thereof, herein jointly declare: . . .
(3) the impediments which derive from crime of affinity in a direct line. (3) it is understood that, in any case, the merits shall not be re-examined. (c) The provisions of Paragraph (2) shall also be applied to marriages celebrated, before the entry into force of the present agreement, in conformity with the norms of Article 34 of the Lateran Concordat and of the law No. 847 of May 27, 1929 and for which a proceeding before the civil judicial authority, as provided by the same norms, has not been initiated. Pontifical Council of the Family, "orphans of living parents"